20th February 2018 - BODIE 3.7 . you'll never walk alone ! I have just read the coda to Fall Girl and your pic fits perfectly. You caught the most important thing in the last scene. Well done. thankyou, yes the final scene with the lads is such a fitting tribute to the way Bodie must be feeling. Oh, that look! And the colours! And we all knew the look Bodie throws at Doyle. Thank you for this, I love it. May I use this as a wallpaper too? yes the look between the lads at the end of this episode speaks volumes, i'm glad that this works for you and of course you can use it as a wallpaper, no problem. Oh this is perfect! And the way you've handled it I think it's much better than the original screen capture which I've always found difficult to work with as Doyle's face always seems very dark. Very well done again! Thank you. Thankyou, i love the final scene of this episode and the look between the lads is such an emotional one. When i have caught this scene before it has took me several attempts and some patience to get it right. I am glad that you like this version and thankyou for looking. Nicely done. The emotion is all there in their faces and their positions. You color scheme makes it so much more real. 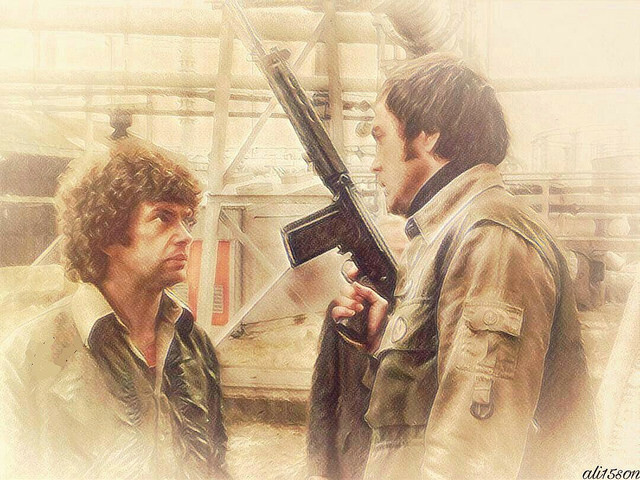 Thankyou, i love the final scene of this episode that is acted out between the lads, the look of betrayal from Bodie at the end and the emotion that sparks between them. I'm glad that this version works for you and thankyou for looking. It's a great moment, you can feel the intensity between them (well, in this case with a lot of anger of course). I really like the effects you've done here too. Thank you for sharing! Great choice of moment! ..Such tension! Thank you! A brilliant rendition of this dramatic scene. Well done!